Alamance County /ˈæləmæns/ ( listen) is a county in the U.S. state of North Carolina. As of the 2010 census, the population was 151,131. Its county seat is Graham. Formed in 1849 from Orange County to the east, Alamance County has been the site of significant historical events, textile manufacturing, and agriculture. Alamance County comprises the Burlington Metropolitan Statistical Area, which is also included in the Greensboro-Winston-Salem-High Point Combined Statistical Area. The 2012 estimated population of the metropolitan area was 153,920. Re-enacting the 1771 Battle of Alamance from the War of the Regulation. Before being formed as a county, the region had at least one known small Southeastern tribe of Native American in the 18th century, the Sissipahaw, who lived in the area bounded by modern Saxapahaw, the area known as the Hawfields, and the Haw River. European settlers entered the region in the late 17th century chiefly following Native American trading paths, and set up their farms in what they called the "Haw Old Fields", fertile ground previously tilled by the Sissipahaw. The paths later became the basis of the railroad and interstate highway routes. Alamance County was named after Great Alamance Creek, site of the Battle of Alamance (May 16, 1771), a pre-Revolutionary War battle in which militia under the command of Governor William Tryon crushed the Regulator movement. Great Alamance Creek, and in turn Little Alamance Creek, according to legend, were named after a local Native American word to describe the blue mud found at the bottom of the creeks. Other legends say the name came from another local Native American word meaning "noisy river", or for the Alamanni region of Rhineland, Germany, where many of the early settlers came from. 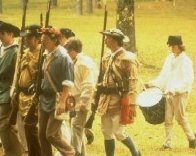 During the American Revolution, several small battles and skirmishes occurred in the area that became Alamance County, several of them during the lead-up to the Battle of Guilford Court House, including Pyle's Massacre, the Battle of Lindley's Mill, and the Battle of Clapp's Mill. In the 1780s, the Occaneechi Native Americans returned to North Carolina from Virginia, this time settling in what is now Alamance County rather than their first location near Hillsborough. In 2002, the modern Occaneechi tribe bought 25 acres (100,000 m2) of their ancestral land in Alamance County and began a Homeland Preservation Project that includes a village reconstructed as it would have been in 1701 and a 1930s farming village. During the early 19th century, the textile industry grew heavily in the area, and so the need for better transportation grew. By the 1840s several mills were set up along the Haw River and near Great Alamance Creek and other major tributaries of the Haw. Between 1832 and 1880, at least 14 major mills were powered by these rivers and streams. Mills were built by the Trollinger, Holt, Newlin, Swepson, and Rosenthal families, among others. One of them, built in 1832 by Ben Trollinger, is still in operation. It is owned by Copland Industries, sits in the unincorporated community of Carolina and is the oldest continuously operating mill in North Carolina. One notable textile produced in the area was the "Alamance Plaids" or "Glencoe Plaids" used in everything from clothing to tablecloths. The Alamance Plaids manufactured by textile pioneer Edwin M. Holt were the first colored cotton goods produced on power looms in the South, and paved the way for the region's textile boom. (Holt's home is now the Alamance County Historical Society.) But by the late 20th century, most of the plants and mills had gone out of business, including the mills operated by Burlington Industries, a company based in Burlington. By the 1840s, the textile industry was booming, and the railroad was being built through the area as a convenient link between Raleigh and Greensboro. The county was formed on January 29, 1849 from Orange County. In March 1861, Alamance County residents voted overwhelmingly against North Carolina's secession from the Union, 1,114 to 254. Two delegates were sent to the State Secession Convention, Thomas Ruffin and Giles Mebane, who both opposed secession, as did most of the delegates sent to the convention. At the time of the convention, around 30% of Alamance County's population were slaves (total population of c. 12,000, including c. 3,500 slaves and c. 500 free blacks). North Carolina was reluctant to join other Southern states in secession until the Battle of Fort Sumter in April 1861. When Lincoln called up troops, Governor John Ellis replied, "I can be no party to this wicked violation of the laws of the country and to this war upon the liberties of a free people. You can get no troops from North Carolina." After a special legislative session, North Carolina's legislature unanimously voted for secession on May 20, 1861. No battles took place in Alamance County, but it sent its share of soldiers to the front lines. In July 1861, for the first time in American history, soldiers were sent in to combat by rail. The 6th North Carolina was loaded onto railroad cars at Company Shops and transferred to the battlefront at Manassas, Virginia (First Battle of Manassas). Although the citizens of Alamance County were not directly affected throughout much of the war, in April 1865 they witnessed firsthand their sons and fathers marching through the county just days before the war ended with the surrender at Bennett Place near Durham. At Company Shops General Joseph E. Johnston stopped to say farewell to his soldiers for the last time. By the end of the war, 236 people from Alamance County had been killed in the course of the war, more than any other war since the county's founding. Some of the Civil War's most significant effects were seen after it ended. Alamance County briefly became a center of national attention when in 1870 Wyatt Outlaw, an African-American Town Commissioner in Graham, was lynched by the "White Brotherhood," the Ku Klux Klan. He was president of the Alamance County Union League of America (an anti-Klan group), helped to establish the Republican party in North Carolina and advocated establishing a school for African Americans. His offense was that Governor William Holden had appointed him a Justice of the Peace, and he had accepted the appointment. Outlaw's body was found hanging 30 yards from the courthouse, a note pinned to his chest reading, "Beware! You guilty parties – both white and black." Outlaw was the central figure in political cooperation between blacks and whites in the county. Holden declared Caswell County in a state of insurrection (July 8) and sent troops to Caswell and Alamance counties under the command of Union veteran George W. Kirk, beginning the so-called Kirk-Holden War. Kirk's troops ultimately arrested 82 men. The Grand Jury of Alamance County indicted 63 Klansmen for felonies and 18 for the murder of Wyatt Outlaw. Soon after the indictments were brought, Democrats in the legislature passed a bill to repeal the law under which the indictments had been secured. The 63 felony charges were dropped. The Conservatives then used a national program of "Amnesty and Pardon" to proclaim amnesty for all who committed crimes on behalf of a secret society. This was extended to the Klansmen of Alamance County. There would be no justice in the case of Wyatt Outlaw. Holden's support for Reconstruction led to his impeachment and removal by the North Carolina Legislature in 1871. During World War II, Fairchild Aircraft built airplanes at a plant on the eastern side of Burlington. Among the planes built there was the AT-21 gunner, used to train bomber pilots. Near the Fairchild plant was the Western Electric Burlington works. During the Cold War, the plant built radar equipment and guidance systems for missiles and many other electronics for the government, including the guidance system for the Titan missile. The plant closed in 1992 and sat abandoned until 2005, when it was purchased by a local businessman for manufacturing. The USS Alamance, a Tolland-class attack cargo ship, was built during and served in and after World War II. According to the U.S. Census Bureau, the county has a total area of 435 square miles (1,130 km2), of which 424 square miles (1,100 km2) is land and 11 square miles (28 km2) (2.5%) is water. The county is in the Piedmont physiographical region. It has a general rolling terrain with the Cane Creek Mountains rising to over 970 ft (300 m) in the south central part of the county just north of Snow Camp. Bass Mountain, one of the prominent hills in the range, is home to a world-renowned bluegrass music festival every year. There are also isolated monadnocks in the northern part of the county that rise to near or over 900 ft (270 m) above sea level. The largest river that flows through Alamance County is the Haw, which feeds into Jordan Lake in Chatham County, eventually leading to the Cape Fear River. The county is also home to numerous creeks, streams, and ponds, including Great Alamance Creek, where a portion of the Battle of Alamance was fought. There are three large municipal reservoirs: Lake Cammack, Lake Mackintosh, and Graham-Mebane Lake (formerly Quaker Lake). As of the census of 2010, there were 151,131 people, 59,960 households, and 39,848 families residing in the county. The population density was 347.4 people per square mile (134.1/km²). There were 66,055 housing units at an average density of 151.9 per square mile (58.6/km²). The racial makeup of the county was 71.1% White, 18.8% Black or African American, 0.7% Native American, 1.2% Asian, 0.02% Pacific Islander, 6.1% from other races, and 2.1% from two or more races. 11% of the population were Hispanic or Latino of any race. There were 59,960 households out of which 29.2% had children under the age of 18 living with them, 47.2% were married couples living together, 14.5% had a female householder with no husband present, and 33.5% were non-families. 27.8% of all households were made up of individuals and 26.6% had someone living alone who was 65 years of age or older. The average household size was 2.45 and the average family size was 2.98. In the county, the population was spread out with 26.7% under the age of 19, 7.2% from 20 to 24, 25.1% from 25 to 44, 26.3% from 45 to 64, and 14.5% who were 65 years of age or older. The median age was 38.7 years. For every 100 females there were 92.50 males. For every 100 females age 18 and over, there were 89.00 males. The median income for a household in the county was $44,430, and the median income for a family was $54,605. Males had a median income of $31,906 versus $23,367 for females. The per capita income for the county was $23,477. About 13.7% of families and 16.1% of the population were below the poverty line, including 25% of those under age 18 and 8.7% of those age 65 or over. The county is divided into thirteen townships, which are both numbered and named. According to a 1975 study of the history of post offices in North Carolina by Treasure Index, Alamance County has 27 ghost towns that existed in the 18th and 19th centuries. Additionally, five other post offices no longer exist. These towns and their post offices were either abandoned as organized settlements or absorbed into the larger communities that now make up Alamance County. The population ranking of the following table is based on the 2010 census of Alamance County. Lying between overwhelmingly liberal and Democratic Orange County and Durham County to the east, equally Democratic Guilford County to the west, and heavily conservative and Republican Randolph County to the southwest, Alamance leans Republican, though not as overwhelmingly as many other suburban counties in the Piedmont Triad. The last Democratic nominee for president to carry Alamance County was Jimmy Carter in 1976. Alamance County is a member of the regional Piedmont Triad Council of Governments. The county is led by the Alamance County Board of Commissioners and the County Manager, who is appointed by the Board of Commissioners. County residents also elect two other county government offices: the Sheriff and Register of Deeds. Alamance County has provided North Carolina with three of its governors and two U. S. senators: Governor Thomas Holt, Governor and U. S. Senator Kerr Scott, Governor Robert W. (Bob) Scott (Kerr Scott’s son), and U. S. Senator B. Everett Jordan. Craig F. Honeycutt began serving as county manager in April 2009. He came to Alamance County from Laurinburg, North Carolina. Walker and David Smith held dual roles as county manager and county attorney during their terms. The Paramount Theater serves as a center of dramatic presentations in the community. To the south there is the Snow Camp Outdoor Drama which has plays from late spring to early fall in the evenings. Alamance County is also home to the Haw River Ballroom, a large music and arts venue in Saxapahaw. Cedarock Park, located 6 miles (10 km) south of the intersection of Interstate 85/40 and NC Highway 49. The park is home to the Cedarock Historic Farm, an old mill dam, and two disc golf courses. Great Bend Park at Glencoe, located 4 miles (6 km) north of the intersection of US Highway 70, and NC Highways 87, 62, and 100 in downtown Burlington. Great Bend Park contains parts of the Haw River Land and Paddle Trails and the Mountains-to-Sea Trail, along with picnicking, fishing, and other opportunities. The park was built around the site of the Glencoe Mills, an area that is currently under renovation with an old mill that has been listed on the National Register of Historic Places. The Burlington Royals are a rookie league baseball farm team based in Burlington. They were previously known as the Burlington Indians, but changed affiliations in 2006 from Cleveland to Kansas City. This version of the team has been active since 1985, but Burlington hosted a minor league baseball team for many years under the Burlington Indians and Burlington Bees. The Elon University Phoenix play in the town of Elon. The Phoenix compete in the NCAA's Division I (Championship Subdivision in football) Colonial Athletic Association. Intercollegiate sports include baseball, basketball, cross-country, football, golf, soccer, and tennis for men, and basketball, cross-country, golf, indoor track, outdoor track, soccer, softball, tennis, and volleyball for women. Today, Alamance County is often described as a "bedroom" community, with many residents living in the county and working elsewhere due to low tax rates, although the county is still a major player in the textile and manufacturing industries. The current county-wide tax rate for Alamance County residents is 58.0 cents per $100 valuation. This does not include tax rates imposed by municipalities or fire districts. Alamance County is served by the Alamance-Burlington School System, several private elementary and secondary schools, Alamance Community College, and Elon University. N.C. Highway 49 runs southwest to northeast from the Liberty area, through Burlington, Graham, and Haw River, to the Pleasant Grove Community area, before turning northeast and continuing into Orange County. N.C. Highway 54 runs from its northwestern end at its intersection with U.S. Highway 70 in Burlington southeast to the Orange County line in the southeast part of the county. N.C. Highway 62 runs southwest to northeast from Kimesville, through Burlington, to Pleasant Grove. It then turns north and heads to Caswell County. N.C. Highway 87 runs from southeast to northwest through the county, from Eli Whitney through Graham, Burlington, and a small part of Elon, before turning northeast and heading through the Altamahaw-Ossipee area, finally moving into Caswell County. N.C. Highway 100 forms a loop through downtown Burlington, starting at the intersection of Maple Avenue and Chapel Hill Road before moving north, then northwest, then going through Elon and moving on to Gibsonville and Guilford County. N.C. Highway 119 runs roughly north from its southern terminus at an intersection with N.C. Highway 54, moving through Mebane and heading north into Caswell County. ^ Talk Like A Tarheel, from the North Carolina Collection's website at the University of North Carolina at Chapel Hill. Retrieved September 18, 2012. ^ a b c "State & County QuickFacts". United States Census Bureau. Archived from the original on July 6, 2011. Retrieved October 17, 2013. ^ "North Carolina Counties - List of all and Alamance County". Archived from the original on October 25, 2009. ^ "Hadley Society Photo Gallery". hadleysociety.org. ^ "The Battle of Clapp's Mills". revolutionarywar101.com. ^ a b "Alamance County, NC". textilehistory.org. Archived from the original on February 16, 2012. ^ "Alamance County North Carolina Genealogy - Family History Resources". kindredtrails.com. ^ "2010 Census Gazetteer Files". United States Census Bureau. August 22, 2012. Archived from the original on January 12, 2015. Retrieved January 11, 2015. ^ "U.S. Decennial Census". United States Census Bureau. Archived from the original on May 12, 2015. Retrieved January 11, 2015. ^ "Historical Census Browser". University of Virginia Library. Retrieved January 11, 2015. ^ Forstall, Richard L., ed. (March 27, 1995). "Population of Counties by Decennial Census: 1900 to 1990". United States Census Bureau. Retrieved January 11, 2015. ^ "Census 2000 PHC-T-4. Ranking Tables for Counties: 1990 and 2000" (PDF). United States Census Bureau. Retrieved January 11, 2015. ^ Promotions, Center for New Media and. "US Census Bureau 2010 Census". www.census.gov. Retrieved March 14, 2018. ^ Leip, David. "Dave Leip's Atlas of U.S. Presidential Elections". uselectionatlas.org. Retrieved March 14, 2018. ^ "Cross Roads History". rootsweb.com. Beatty, Bess. Alamance: The Holt Family and Industrialization in a North Carolina County, 1837-1900 (LSU Press, 1999). Bissett, Jim, “The Dilemma over Moderates: School Desegregation in Alamance County, North Carolina,” Journal of Southern History, 81 (Nov. 2015), 887–930. Pierpont, Andrew Warren. Development of the textile industry in Alamance County, North Carolina (1953). Troxler, Carole Watterson. Shuttle and Plow: A History of Alamance County, North Carolina (1999). Whitaker, Walter E. Centennial History of Alamance County 1849-1949 (Burlington Chamber of Commerce, 1949). Wikimedia Commons has media related to Alamance County, North Carolina. This page was last edited on 28 February 2019, at 01:20 (UTC).